One of the most severe outcomes of spinal cord injury from car accidents, sports impacts, or other neck trauma, is losing the ability to control breathing, with patients often requiring artificial ventilation for the rest of their lives. Researchers at Jefferson (Philadelphia University + Thomas Jefferson University) recently tested a hydrogel that releases a nerve-protecting agent at the site of injury, restoring independent breathing in rat models. "The hydrogel can deliver a neuron-stimulating agent that repairs a critical aspect of spinal cord damage, while avoiding systemic side effects of the agent," said co-senior researcher Angelo Lepore, Ph.D., Associate Professor of Neuroscience in the Vickie and Jack Farber Institute for Neuroscience at Jefferson. "We looked specifically at the bundle of nerves that control breathing. Our preliminary work in animal models could lead to new treatments in the future for patients suffering from respiratory compromise, and may also apply to restoring other functions affected by the injury." The work was published June 11th in the The Journal for Neuroscience. Dr. Lepore and Yinghui Zhong, Ph.D., a collaborator from Drexel University, developed a gel that binds to the neuro-stimulating agent BDNF (brain-derived neurotrophic factor), and releases this nerve-repair protein at the site of injury. "The gel has the property of being able to release a specific dose, over a controlled period of time, in a particular area, can be implanted in a safe manner, and is biocompatible so the body does not mount an immune response to it," said co-first author Biswarup Ghosh, Ph.D., a research associate in Dr. Lepore's laboratory. BDNF is a known nerve-growth factor, and has been explored in clinical trials for ALS patients. But when it circulates systemically through the blood and entire nervous system, it can cause side effects such as muscle spasms and chronic pain, characterized by increased sensitivity to pain or the feeling of pain from stimuli that normally would not hurt. "Injecting the BDNF-infused gel only at the site of injury, we can bypass these side effects," said Dr. Lepore. Although many types of nerves will be affected by spinal cord injury, the researchers looked specifically at the bundle called the phrenic nerve that specifically controls the diaphragm—the muscle that primarily controls the rhythmic inflation of the lungs. The researchers saw a 60-70 percent improvement in breathing control as measured by diaphragm-muscle contraction in rats that received the BDNF gel after spinal cord injury. 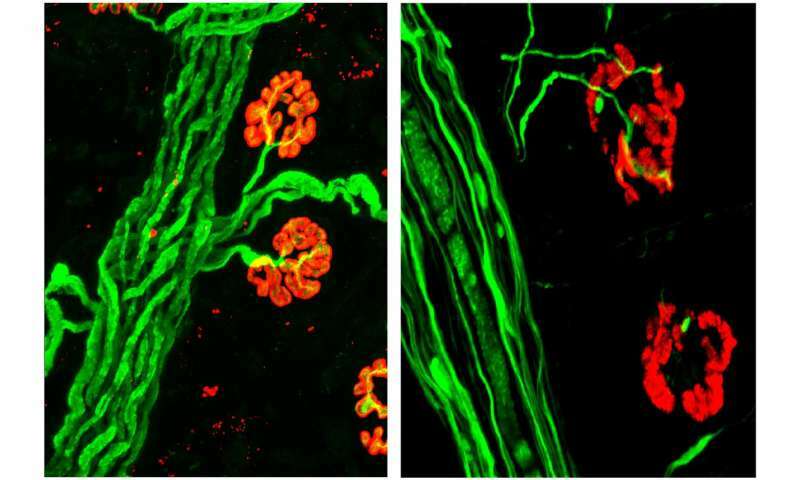 Looking at the changes at the cellular level, the researchers observed two ways the BDNF-gel protected or helped maintain the brain-to-spine-to-diaphragm connection. The long phrenic nerves, with one end of the cell sitting at the spinal cord and the other end touching, or innervating, the diaphragm muscle, would sometime release their connection to the muscle when the other end of the nerve was damaged at the spinal column. Dr. Lepore and colleagues showed that the gel helped nerves reconnect, or protected these nerves from releasing in response to the damage, in effect, helping retain the spine-to-diaphragm connection. Another set of nerves travels from the brain to the spinal column to help set and maintain the rhythmic control of inhalation. Those nerves can also be damaged during injury. 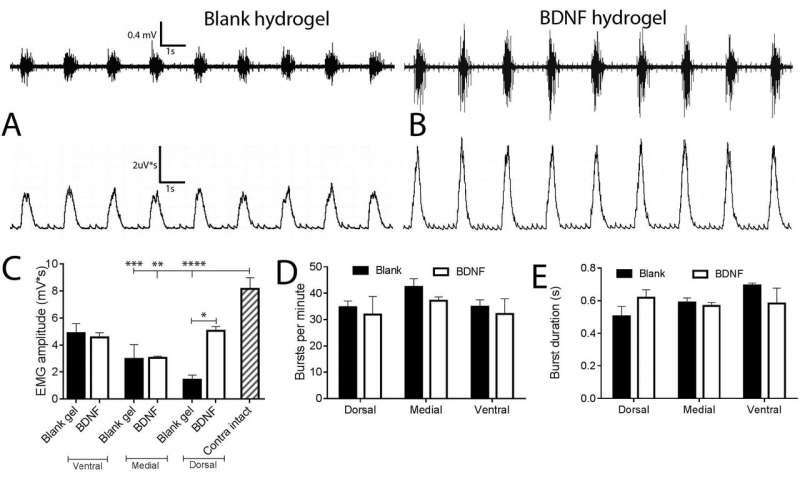 Dr. Lepore and colleagues showed that the BDNF gel helped regrow the nerves that connected the rhythm-control center of the brain with the spine and ultimately the diaphragm muscle. "Although there are yet other types of damage that can occur during spinal cord injury, it's encouraging to see this gel improve two extremely-important mechanisms by which breathing control is lost," said Dr. Lepore. The researchers plan to continue the work by exploring the ideal timing and dosing for applying the biogel. Specifically, they would assess whether it could work in instances where treatment isn't immediately available after injury. They are also interested in exploring whether the approach could protect or regrow other types of nerves, and help patients retain more functionality. More information: Biswarup Ghosh, Zhicheng Wang, Jia Nong, Mark W. Urban, Zhiling Zhang, Victoria A. Trovillion, Megan C. Wright, Yinghui Zhong, Angelo C. Lepore, "Local BDNF delivery to the injured cervical spinal cord using an engineered hydrogel enhances diaphragmatic respiratory function," The Journal for Neuroscience, DOI: 10.1523/JNEUROSCI.3084-17.2018 , 2018.